Conductor and composer, Laurent Petitgirard is a versatile musician. He regularly composes for films, but also writes for the concert hall. I suspect that in many French-speaking countries he may best be known for his atmospheric, somewhat nostalgic score for the Maigret TV series. He has also composed quite a number of orchestral works, works for voice and orchestra as well as two operas, of which the first, Joseph Merrick The Elephant Man has already been recorded (Naxos 8.557608/9 - see review). The present release offers three substantial orchestral scores composed over the last twenty or so years. The earliest one is the suite from his ballet Euphonia. The libretto is based on the eponymous fantastic short story by Hector Berlioz. The story is about a futuristic musical city Euphonia in which a jealous composer Xilef (anagram of Felix) sets a musical trap to destroy the woman who spurned him and her lovers. The argument is further described in the insert notes, so that I need not go into any details about it. Anyway, the ballet’s argument provides the composer with many opportunities for colourful illustrative music, often of considerable imagination and energy. No doubt that Petitgirard’s experience gained in writing for films has helped, but there is nothing derivative about this very fine score. The music, here as in the other works, has a distinctive tone. I hear harmonies, turns of phrase and orchestral sounds also heard in the Maigret score, which says much – I think – for Petitgirard’s stylistic coherence. This stylistic coherence is further displayed in the more recent works. Les Douze Gardiens du Temple is in effect a tone poem, that ultimately pays homage to Debussy. The title might suggest an allusion to the twelve tones, on which any music is generally based; but the music is certainly neither atonal nor serial, although it is packed with invention and is superbly scored by a master orchestrator. The piece opens with an arresting gesture, a sort of call-to-arms, to rivet one’s attention. The music then unfolds rather rhapsodically in a series of contrasting sections that make-up what the composer describes as a “journey of initiation”. This is a very fine piece indeed, maybe just a bit too long for its own good; but the music is often very fine and strongly expressive. This is really the sort of work, that might reconcile “unbelievers” with well-crafted, accessible contemporary music. However, fine as these works are, the real gem in this attractive release is the imposing Poème pour grand orchestre à cordes completed in 2002. This compact piece “corresponds to a desire for fluidity, after the darkness of the opera Joseph Merrick” (the composer’s words). Beautifully scored for large string orchestra, the music unfolds almost effortlessly throughout its twelve-minute span; but the musical substance is such that you might be forgiven for thinking that the piece actually lasts much longer. I am in no doubt about it: this marvellous work is a minor masterpiece that clearly deserves wider exposure. Actually, this very fine release would be worth having, for the Poème alone. 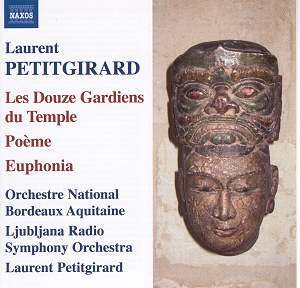 Petitgirard’s music does not break any new ground, and clearly belongs to what is generally referred to as the 20th century mainstream. His models are Debussy, Ravel, Honegger and – at times – Dutilleux or Messiaen; but make no mistake about it: the music is highly personal, superbly crafted and – most importantly – strongly expressive. Certainly it is too fine to be ignored. I hope that Naxos will record more of his concert music soon. There is anyway much to enjoy here.